When I hear you talk, it seems to me that the Nintendo 3DS system isn’t just filled with built-in software for no reason at all. You put all these things in because you wanted the system to be played in certain ways. That part of your desire is reflected in it. Yes. The Nintendo 3DS system is sometimes said to just be a “Nintendo DS system with higher specs.” But it’s really much more than that. It’s a gaming system with an entirely different charm. That’s why, for the customers who purchase it, I want them to fully enjoy the features of this new machine. A charm that they can understand even without purchasing other games for it. That’s right. I want them to first feel the draw of the system itself. That’s something I really want to happen. The other day, the conversation with Shigesato Itoi-san got into Touch! Generations software for the Nintendo DS system, didn’t it? 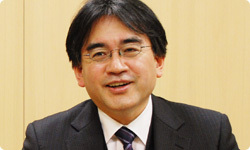 In short, Dr. Kawashima’s Brain Training6 and English Training7 brought about a connection between the Nintendo DS system and people who had hardly ever played a game before. We came up with the name Touch! Generations for the games that were beyond the scope and range of the genres in the past. 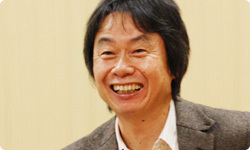 But you said that the hardware of Nintendo 3DS itself is going to be part of Touch! Generations ethos. I really thought that was a very good way to put it. 6Dr. Kawashima’s Brain Training: How Old is Your Brain? : Software released for the Nintendo DS system in May 2005 in Japan. 7English Training: Software released in Japan and Europe for the Nintendo DS system in 2006. It really made a lot of sense. Ultimately, what we really want to do is first of all we want people who purchase the Nintendo 3DS system to experience something they can’t anywhere else. Then if they find it surprising or impressive, that experience can be conveyed to other people around them spontaneously. I hope it can really expand to newer and greater experiences everywhere. It would be best if it happened that way. The greatest charm of the Nintendo 3DS system, including the 3D images, is very difficult to convey just through the TV or the Internet. Of course, we have tried very hard to do so, and we did our very best in the demonstrations. But I think it would be most ideal for the people who purchase it to try to tell others what they like about it. And to do that, we wanted to build in all the basic attractions that we want them to experience. Yes. That in itself really makes the hardware of Nintendo 3DS a part of the Touch! Generations ethos. Whether it is for AR Games or Face Raiders, they are certainly very worthwhile titles. When we organised demos for people to play them, I saw they were happy, surprised or smiling all the way through. Yes. I really saw that, too. It’s like the hardware itself is an eloquent orator. You’re right. It’s an eloquent hardware. Now it’s a matter of how far we can reach beyond that. Yes.I want as many people as possible to experience the joy they can feel by themselves with the 3D images, as well as to enjoy the emotions they can get only through StreetPass with countless other people. That feeling is very distinct. Don’t you remember how StreetPass happened between us just the other day? I wonder why it made me so happy. (laughs) Right now, lots of employees are experiencing the results of StreetPass inside Nintendo. It’s a very interesting phenomenon. Once StreetPass has taken effect for someone even once, your interest in it grows exponentially. It’s because someone very close to you has a Nintendo 3DS system, just like you do. There’s a different kind of charm to it compared to exchanging data online with someone halfway across the world on the Internet. It makes you feel that you’re sharing the space and time together, on the spot. People will understand what we mean once they experience it. I really want everyone to see for themselves. I’m sure that if they get to use StreetPass in a huge country like America, it’ll be even more fun. I agree in that I want everyone to experience everything at least once. Whether it’s with StreetPass, 3D images, AR Games or Face Raiders, I just want everyone to try it out. When you do a gaming exhibition, all the preconceptions about previous exhibitions stick with you. There can be a notion that focusing on our more prominent packaged software is most important, and we always end up with the floor layout being primary concerned over what to do with Mario or Zelda games. The built-in software becomes completely secondary. But as a company, we believe the best way to get people to understand the charms of the Nintendo 3DS system is through the built-in software. That’s why we decided to push forward in showcasing them in our recent exhibition. That’s right. We decided to show this and that and other things, too. We change the floor plan of the exhibition spaces drastically to make this happen. The scale of development may be small, but each one of the built-in software programmes and games is crucial in conveying the ideas and charms of the Nintendo 3DS system as a new machine. Yes. And looking at the reactions of the guests who came to the exhibitions, I think that choice wasn't wrong after all. Such reactions from players are the best way to get the message across to other people. That’s right. We have them start off like that and then go into the deeper end through individual games. If we can have them play like that, it’ll be great.